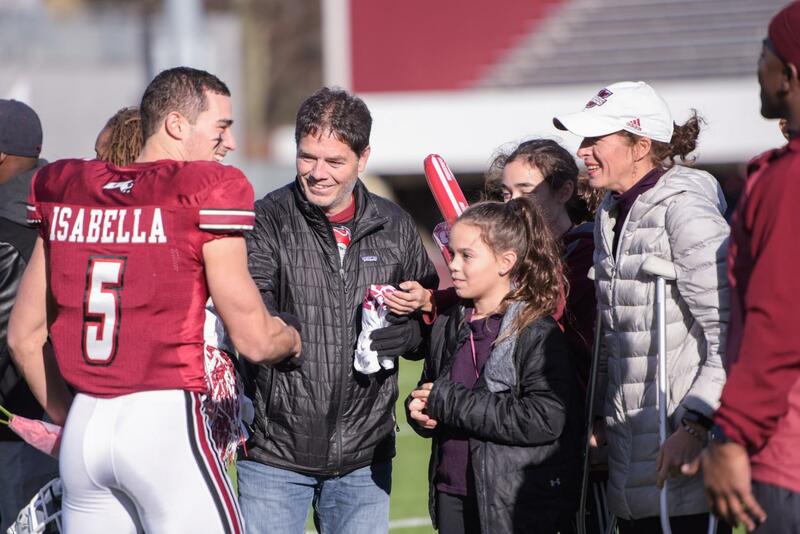 Andy Isabella showed up on homecoming weekend with his best performance of the season, as his 303 receiving yards broke the UMass single-game record and propelled the Minutemen to a 62-59 victory. Isabella’s performance broke UMass’ (4-6) record for receiving yards in a game, set back in 2008 and the record for most receiving yards against Liberty (4-4). More importantly, for the first three quarters, the UMass offense more or less rested on Isabella’s shoulders, and time and time again he came through. Isabella opened the scoring midway through the first quarter, blazing past the Liberty defense and catching the ball on his fingertips before outrunning everyone to the end zone. In the second quarter, Isabella took a screen pass and sprinted down the sideline for a 61-yard score, aided by a nice block from fellow wide receiver Sadiq Palmer. Although he didn’t reach the end zone afterwards, Isabella went on to record catches of 58 and 48 yards, with nearly all of his total coming in the first three quarters. A 21-yard catch early in the fourth quarter marked his final yards of the game, as Liberty finally doubled down on its coverage with a 14-point lead. The focus on Isabella late in the game ultimately cost the Flames, as Marquis Young, Palmer and Sam Emilus took over to come back and win in overtime. Early in the game, Liberty answered Isabella’s dominance with a playmaking receiver of its own, Antonio Gandy-Golden. Gandy-Golden dominated Isaiah Rodgers in man coverage early on, recording catches of 32 yards, 27 yards and 15 yards on Liberty’s first touchdown drive. Gandy-Golden finished with two touchdowns and 205 yards of his own, most of which came in the first half. Isabella outpaced him throughout the game, as UMass relied on the senior wideout to carry the offense. The win was the second straight for UMass and the second straight as a starter for Comis, who took over for the injured Andrew Ford. Comis and Isabella were on point on Saturday, connecting on nine passes. The previous single-game record for receiving yards was held by Victor Cruz, who went on to play for the New York Giants.